My mother, not believing that anyone would ever want to marry her, had two choices as a young girl. I call them “choices”–I should say that she had two dreams. Only they weren’t actually “dreams”–simply her view of best possible outcomes. One was to be a teacher, the other a nurse. My mother was born in the U.S. to an extremely Northern European family that could not “be having with” bodies, so she opted, eventually, for teacher. Pay attention to the “eventually.” Long before she could dream of (or, accept) becoming a teacher, her father wanted her to be a hired girl. Not that my grandfather thought his daughter could not manage becoming a teacher or nurse–she was the valedictorian of her high school–he just thought she should take the first paying job she could get; being a hired girl had the added bonus of also providing for her keep. But my mother persisted–and to my grandfather’s credit, he let her persist–and World War II served as a stepping stone out of hired girldom, allowing her, under its heavy cloud, to take on greater variety of work than ever previously available to women. Her burning desire to visit California turned, oddly, not into a trip to California, but into a job with the U.S. occupation force in Yokohama, Japan where she lived from 1947-1949. On her return to the U.S., there were her same choices once again–teacher/nurse–and–oh yes–typist. Ironically, after earning (and personally paying for) her college degree, her career dream was to become a typist with the U.S. foreign service. But by that time, amazingly to her, she had found someone to marry her, someone she loved; being a married woman in the U.S. foreign service was simply not a “go”. My mother was not a born teacher. She cared deeply about helping kids learn and she worked extremely hard–but she did not have the gift of maintaining control of a class. This meant that teaching (often with 32 or 33 in a room) could be a nightmare (as in, she sometimes cried at night.) Still, she kept at it for thirty years. Did I mention that in the first full year of my life she had to pretend that I didn’t exist? This, because of a law in Maryland at that time, which automatically reduced a teacher’s pay to substitute’s rates (i.e. maybe two-thirds) if she had a child at home below the age of one. After that first year in hiding, I had many more choices than my mother, in part because her second salary in our household helped pay for my good education. But, unlike the male members of my family, I simply did not have what it took to pursue the careers of my heart. How much did this relate to my being a woman? All I know for certain is that I just didn’t have the ego, confidence, self-esteem, or just plain selfishness, to reach for my wishes. 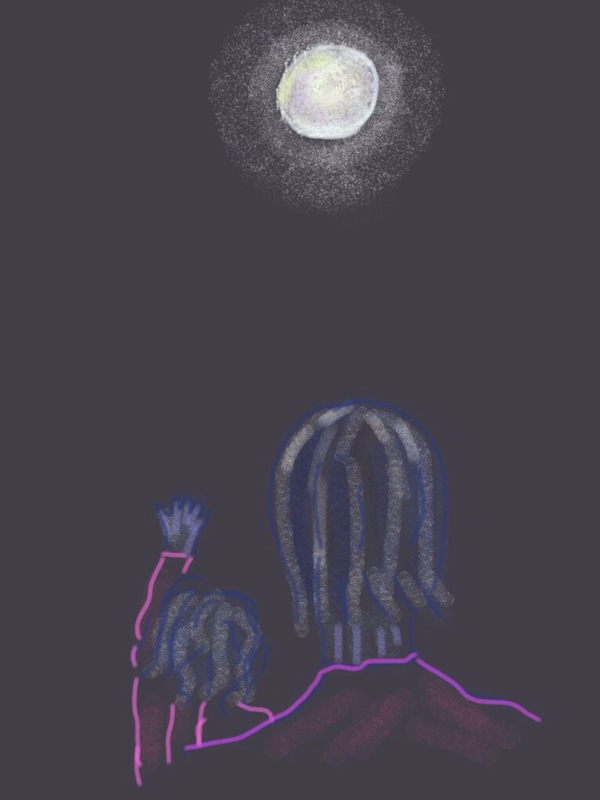 As in the case of my mother, my dreams felt like the moon to me–not because I wasn’t talented enough, but because I wasn’t somehow cool enough, hip enough, deserving enough–qualities that seemed especially important in a girl reaching for the moon. Because the jobs I needed to take to support myself while I aimed for the moon–i.e. being a waitress to support myself while trying to make it as a writer–exposed me at times to a kind of dismissive treatment from the world that my weak ego just couldn’t stomach. Then, finally, there was the guilt. My mother really wanted me to to have a clearly defined way of earning a good wage–i.e. “something to fall back on.” I couldn’t bear to disappoint her. So rather than become a hired girl, I became a lawyer (a “hired gun” as some used to call it.) Only it turned out being an attorney is not something you actually fall back on, but rather it is a job you actively need to pursue many hours of the day. I want to say this first: I am so grateful to my employers for the jobs I’ve had. There are too many men and women both who have no chance of any good job; too many men and women who don’t even consider fulfilling a dream, too many men and women who, even working night and day, cannot provide for their children. My complaint is just that there are so many many many women in the non-dream boat–women holding the bag, women raising the kids, women holding the bag and raising the kids. There are so many women, who have so few choices in how they make their living, only knowing that they better hurry up and get busy at it. Of course, there are men in this situation too. Many obstacles in life are not gender-based. Yet the fact remains that in the U.S. and the world, the majority of those living in poverty are women and children. (The non-dream boat isn’t exactly a life boat, even if one feels stuck in it for life.) This is not because of women’s liberation–women have not “empowered” themselves into lives in poverty–( women’s liberation did not begin in a context in which women had control over their economic and personal lives)–rather, it is because of all kinds of worldwide economic and societal factors. I am convinced, based on her lifelong career, that Hillary Clinton cares for these women. I am not saying that she gives preference to women and their work and dreams over the work and dreams of men. But she understands the special challenges that women face based upon our history and the reality of our present, and she understands that in much of the greater world, especially, helping women to some share of economic power must be a priority. This entry was posted on October 16, 2016 at 9:01 am and is filed under iPad art, news, Uncategorized. You can subscribe via RSS 2.0 feed to this post's comments. Wow! Thanks for sharing and elucidating one of the many reasons we support HRC and love our mothers. I’m inspired, Moon! Thank you so much, Lynn. k.